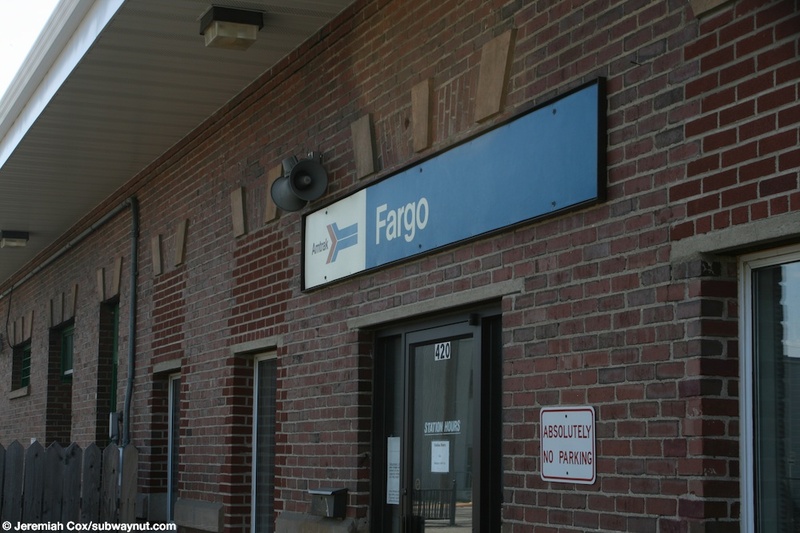 Fargo, ND Amtrak station is located on the northern side only a few blocks from the center of downtown. 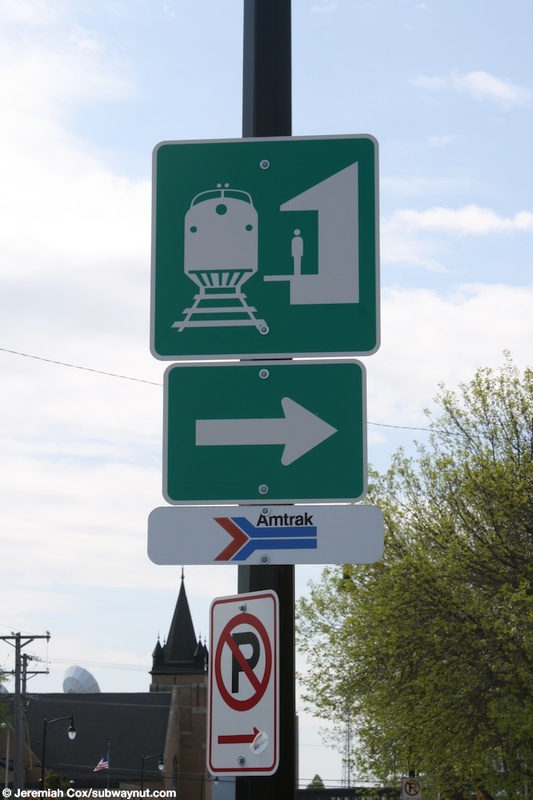 The station is located at a grade along a trackway that passes with grade crossings basically directly through downtown Fargo. 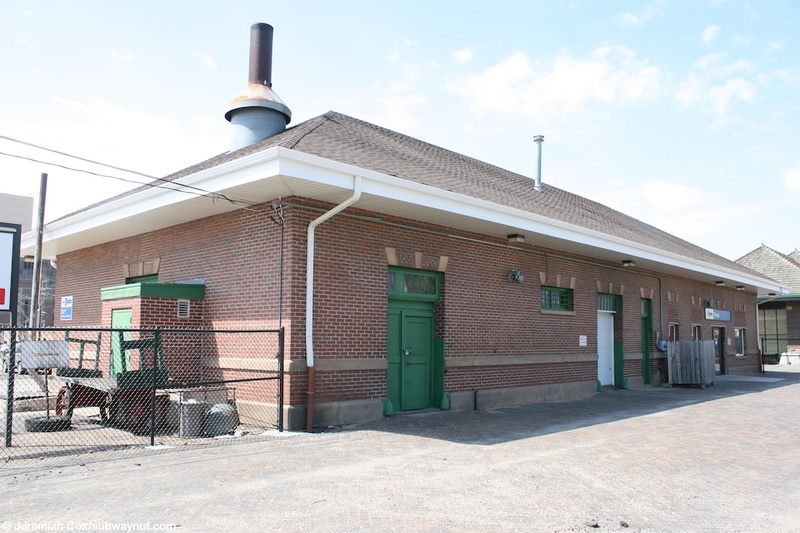 There is also a freight line on the southern side of downtown that passes through at a grade, causing traffic jams, but no longer has any passenger service although it appears that the former train station house for that route has been turned into regular shops. 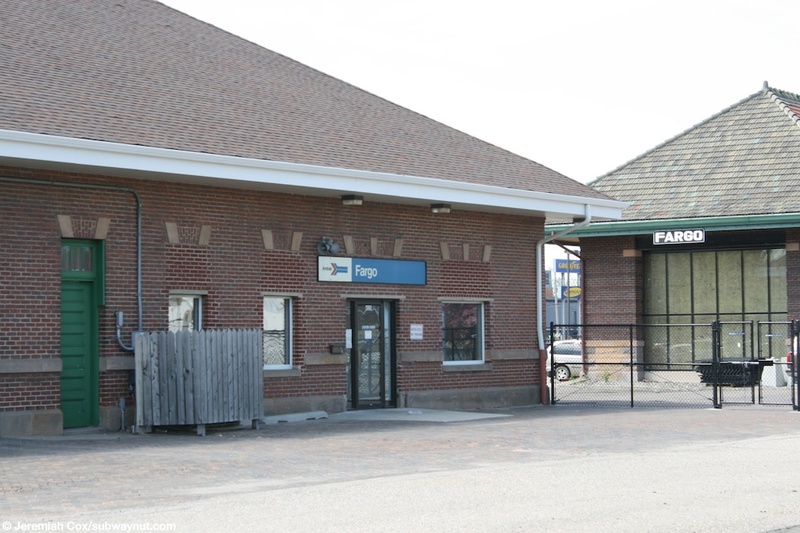 The current station is located in a small, but quite older looking building. 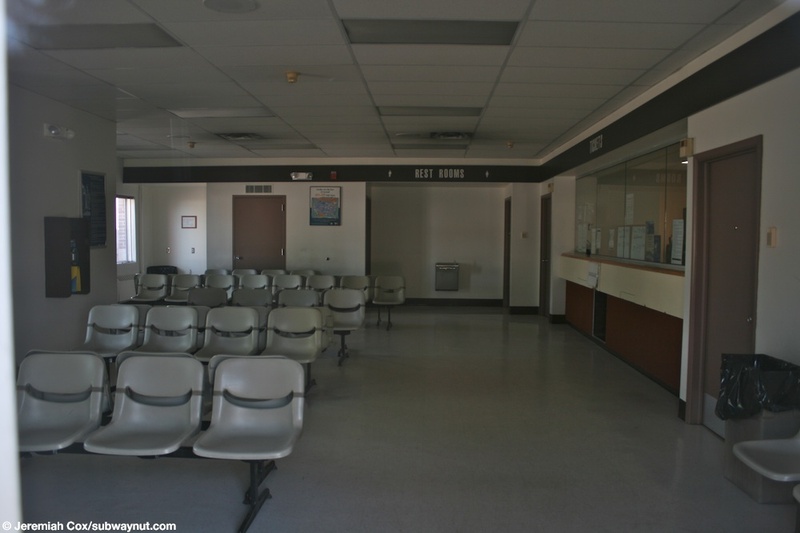 It faces a long and quite wide platform, it is opened also only in the middle of the night and is a service stop when the Empire Builder passes through town. (fargo1) Approaching the Fargo, ND Station building. 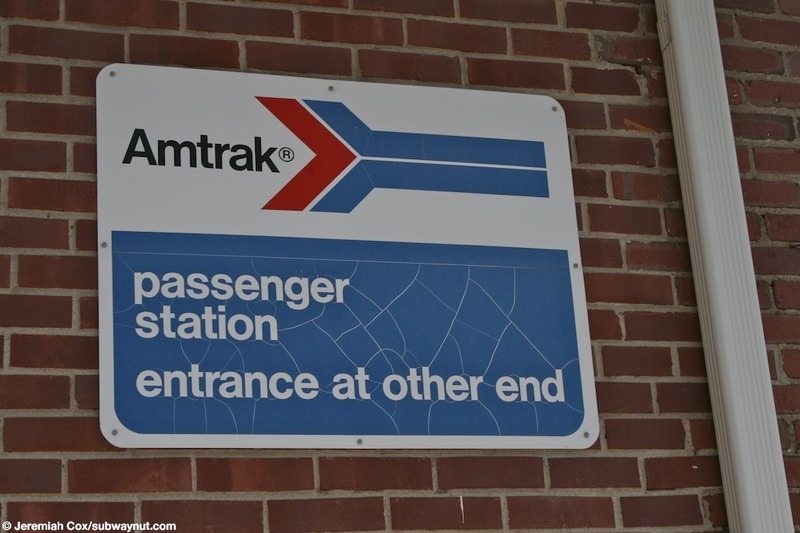 22 May, 2009 (fargo2) An old format sign at Fargo informing Amtrak passengers that the passenger station entrance is at the other end. 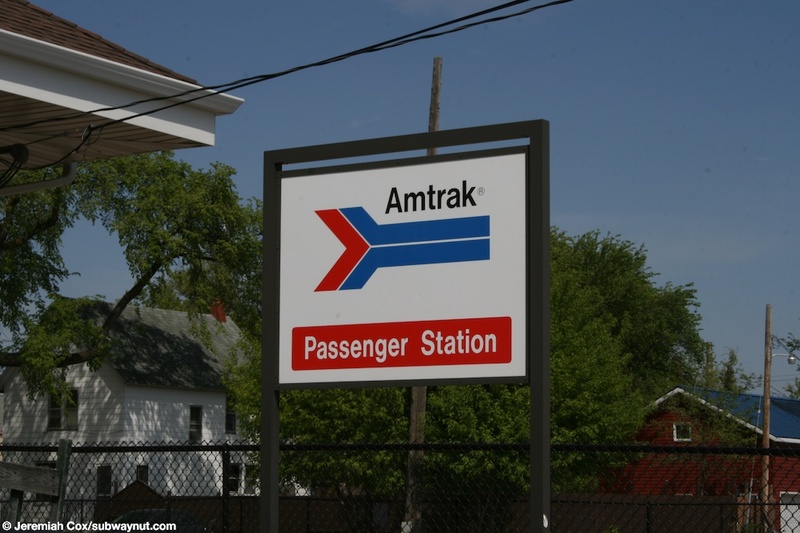 22 May, 2009 (fargo3) A generic Amtrak pointless arrow, Passenger Station sign at Fargo, ND. 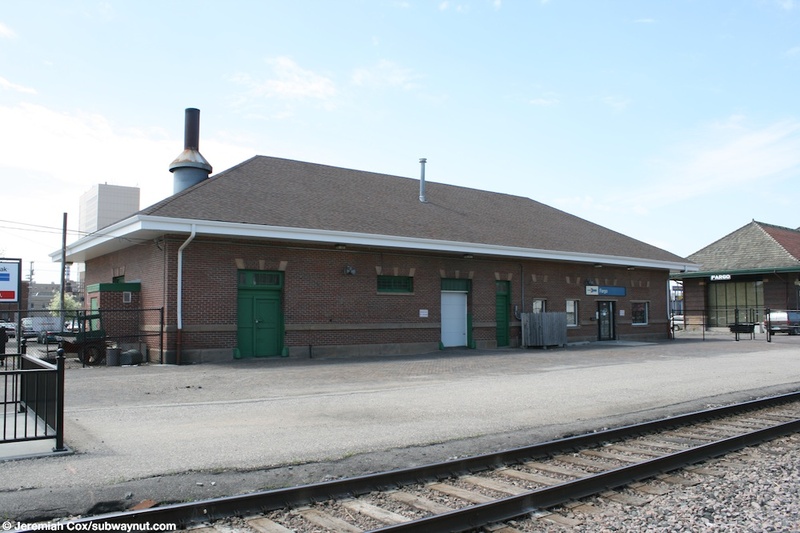 22 May, 2009 (fargo4) Another view of a side of the small Fargo, ND station house. 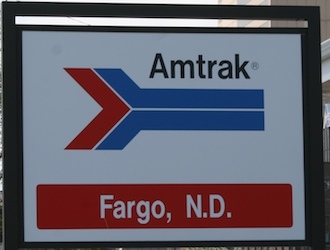 (fargo5) An Amtrak Fargo, ND station sign. 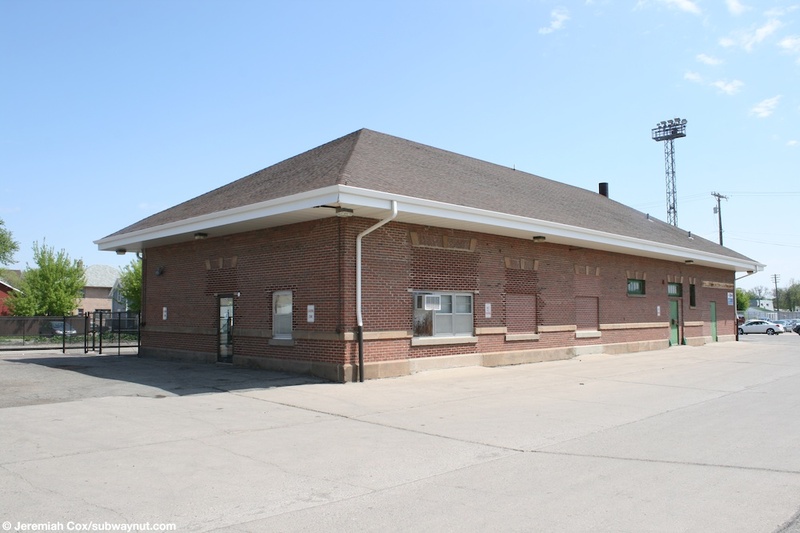 22 May, 2009 (fargo6) A trackside view of the Fargo, ND station building. 22 May, 2009 (fargo7) Looking down the long platform at Fargo, ND. 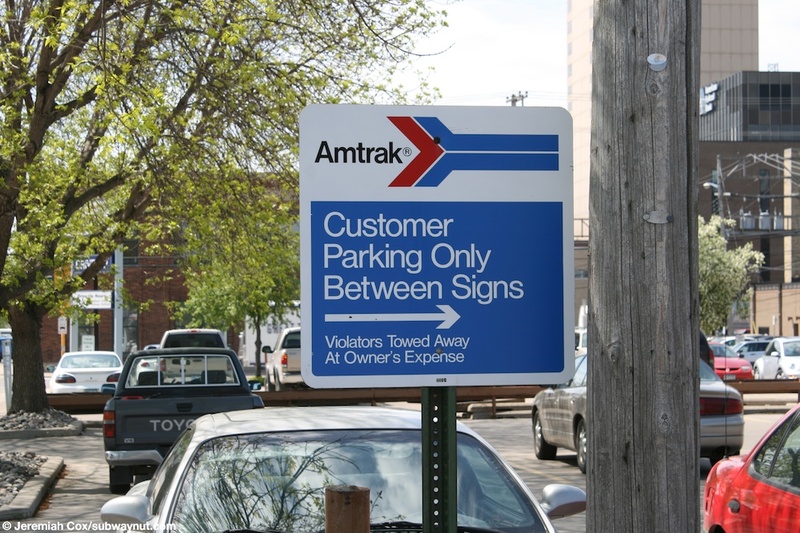 22 May, 2009 (fargo8) A sign in the small parking lot at Fargo, ND telling Amtrak passengers where to park. 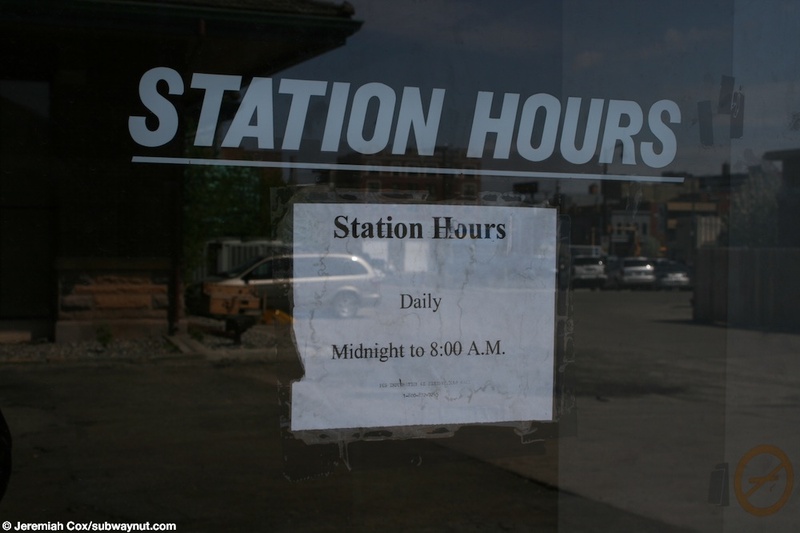 (fargo9) The Fargo, ND Amtrak station's late night hours, Daily Midnight to 8AM. 22 May, 2009 (fargo11) An old style Fargo platform sign above an entrance door to the station. 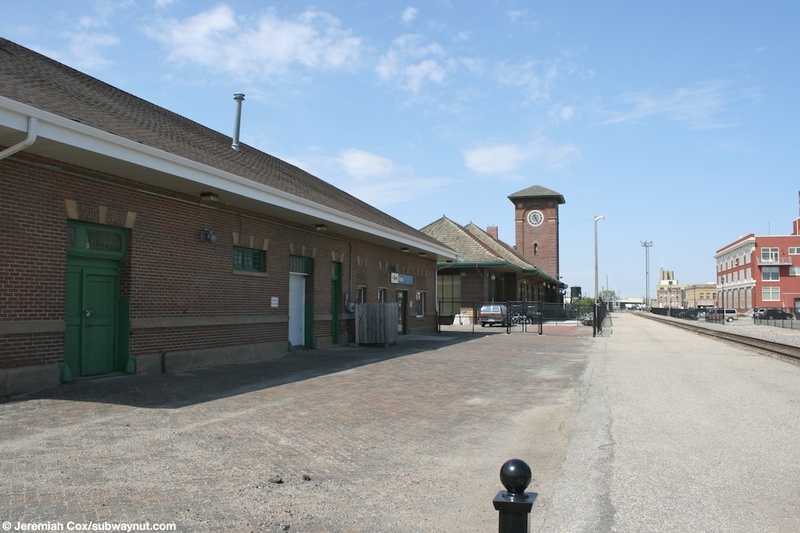 22 May, 2009 (fargo12) Looking across the single track to the wide station building and platform at Fargo, ND. (fargo13) Two signs that say Fargo, one in the Amtrak font and another in a building that has a clock tower, that is now a bike shop. 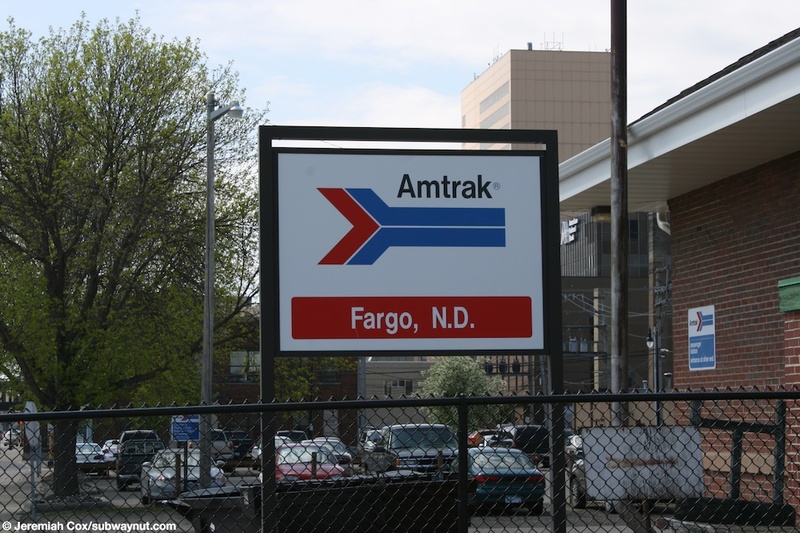 22 May, 2009 (fargo14) An generic Railroad station sign with Amtrak written beneath it in Fargo, ND. 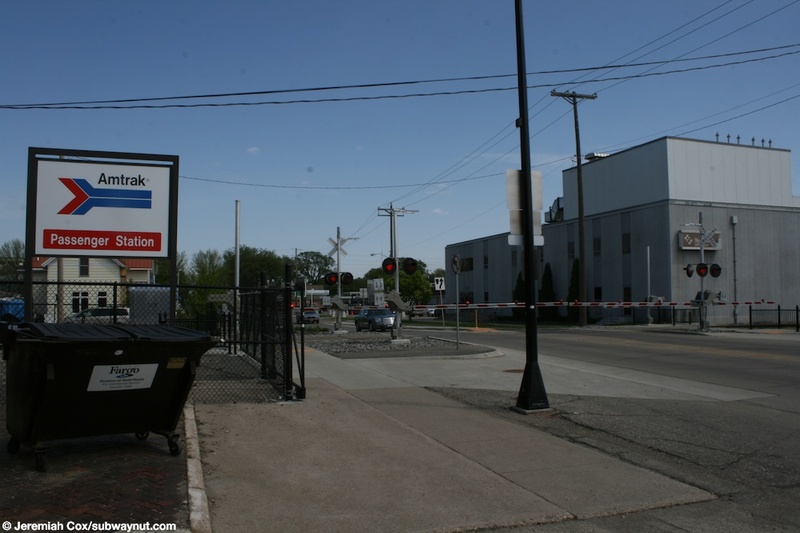 22 May, 2009 (fargo15) The grade crossing right at the Fargo, ND Amtrak station has its gates down. 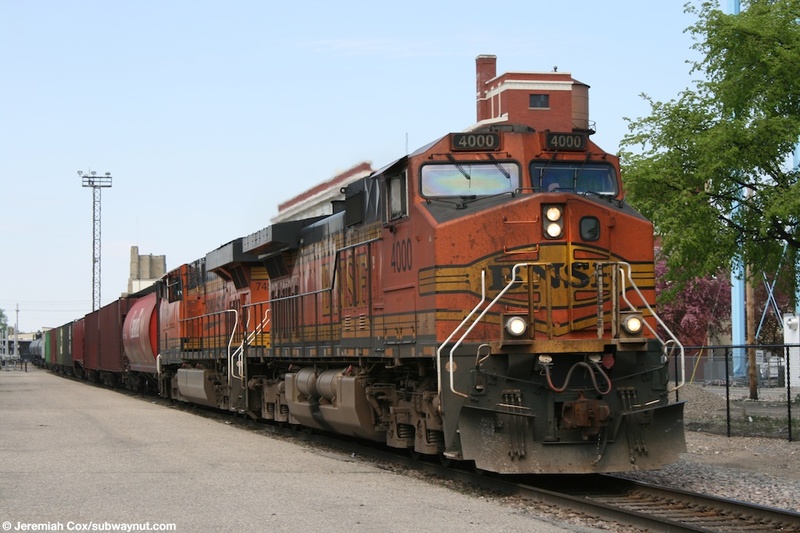 22 May, 2009 (fargo16) BNSF Dash 9-44CW Locomotive #4000 leads a mixed-goods train by the Amtrak Station platform in Fargo, ND.